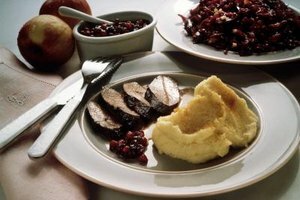 Serve venison with potatoes and vegetables. Venison is a delicacy in many parts of the world, but deer meat sometimes retains the flavor and scent of the wild, often referred to as gaminess. While some prefer this taste, others prefer to make venison seem more like familiar farm-raised animals. According to A. D. Livingston, author of “The Venison Cookbook,” soaking the venison in baking soda and water improves the appearance of the deer meat and removes most of the odor. Mix 1 tablespoon of baking soda per quart of cold water to soak 2 to 3 pounds of meat. Place the venison in a glass or plastic bowl or container. Baking soda may react with the surface of metal bowls, altering the flavor of the meat. Soak stew meats and other small cuts of venison overnight. Soak larger cuts, such as roasts and ribs, for two days. Rinse the meat with cold water before using it in your favorite recipe. Pat the meat dry with paper towels or soft cloth. Another treatment for venison is to soak it overnight in milk to tenderize it and remove gamey odors and flavors. Store fresh venison in a cooler covered with ice for two weeks to age the meat. Drain and replace the ice as needed. The aging process tenderizes the meat and improves the flavor. Many hunters hang the deer outside in temperatures between 30 and 40 degrees Fahrenheit for two weeks to age it. Ground venison must be cooked to a temperature of 160 degrees Fahrenheit to avoid health risks, while roasts are safe at an internal temperature of 145 F. Soups, stews and casseroles need to be heated to 165 F.